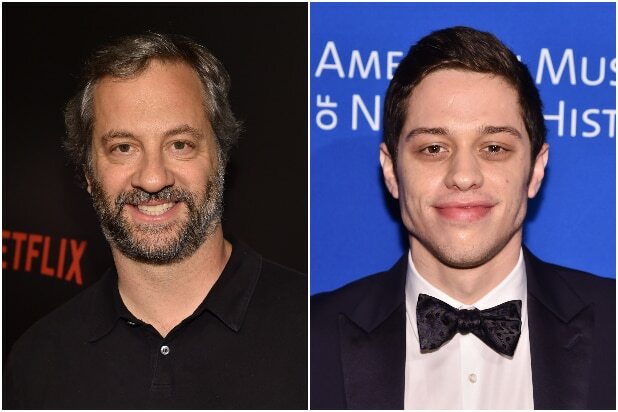 “SNL” actor Pete Davidson will star in a new comedy being set up at Universal from director Judd Apatow, the studio announced Tuesday. Apatow and Davidson co-wrote the film with Dave Sirus, and the untitled comedy will begin production this summer in New York City. There’s no logline just yet, but THR notes that the film is being described as a semi-autobiographical story of Davidson’s life. Davidson has frequently mentioned on social media, in interviews and in his comedy how he lost his father at age 11 in the Sept. 11 World Trade Center attacks in New York, and that he now often struggles with bipolar disorder and even suicidal tendencies. This is Apatow’s sixth feature and his first since the 2015 Amy Schumer comedy “Trainwreck.” He’ll also produce for his Apatow Productions alongside Barry Mendel. Universal EVP of Production Erik Baiers will oversee production on behalf of the studio. Davidson is repped by Brillstein Entertainment Partners, ICM Partners and Josh Sandler. Apatow is repped by Mosaic, UTA and attorney Bryan Wolf. Sirus is repped by ICM Partners.